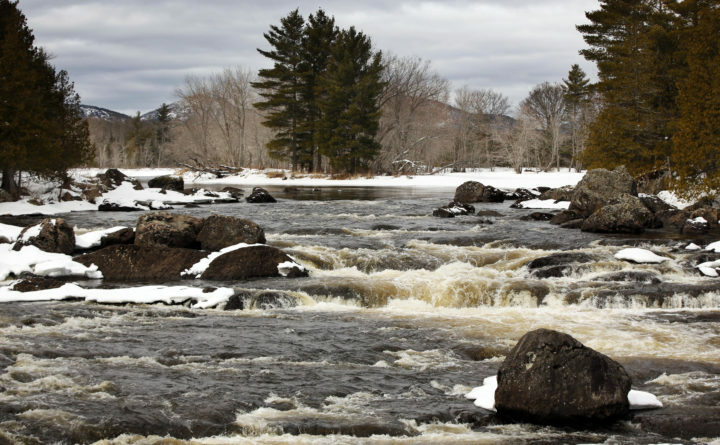 In this Sunday, March 4, 2018 photo water flows through Haskell Pitch, a series of drops on the east Branch of the Penobscot River in the Katahdin Woods and Waters National Monument in Northern, Maine. The cascades are one of several areas requiring portage for canoeists traveling through the park in warmer months. LePage spokeswoman Julie Rabinowitz said Monday that LePage reversed course on his previously stated ban. The reasons: U.S. Interior Secretary Ryan Zinke opted to keep the monument intact ― against LePage’s wishes ― and Katahdin Woods and Waters National Monument Superintendent Tim Hudson submitted a second request for signs on March 28. As first reported by Maine Public, the Maine Department of Transportation “is working with U.S. Department of Interior officials to expedite the production and installation of the KWWNM signs,” Rabinowitz said in an email on Monday. LePage had refused to allow official signs along Interstate 95 and routes 11, 157 and 159 — all Katahdin region main roads — saying that it would be wasteful to do so if Zinke recommended that President Donald Trump rescind former President Barack Obama’s designation of the monument. The Bangor Daily News learned in August, and Zinke confirmed in December that he wouldn’t recommend significant alterations to the 87,562-acre collection of parcels east of Baxter State Park. Critics said that LePage’s ban was “mean-spirited” and delaying the inevitable. As described in a two-page letter, Hudson’s latest request seeks 17 signs. That’s last year’s request for six monument signs to go along Interstate 95 and 11 more on state roads in Island Falls, Medway, Patten and Sherman. Hudson said he heard from state transportation officials 10 days ago that the request was in process. It might have gotten approval more recently. He has been out-of-state for several days attending to a family matter, he said. Hudson’s request seeks three signs for I-95’s Exit 244, north and south, in Medway. Two signs will go on the northbound and southbound sides near Exit 264, in Sherman, and one sign on the southbound side for Island Falls’ Exit 276, according to the request. This year’s request seeks more signs for Routes 11, 157, 158 and 159. Monument proponents said the lack of signs hurt the monument’s ability to draw visitors. Katahdin Woods was visited last year by at least 15,000 people ― 7,162 vehicles for the year as of Nov. 27, the day its main Loop Road closed for the season. Hudson conservatively assumes the vehicles, which registered on counters at three monument entrances, each carried two people, for a total of 14,324 visitors. Some people also count as monument visitors the estimated 15,000 snowmobilers who travel through the park on state trails. Katahdin Woods will open its roads as soon as the snow melts and they dry out ― by Memorial Day at the latest, Hudson said.